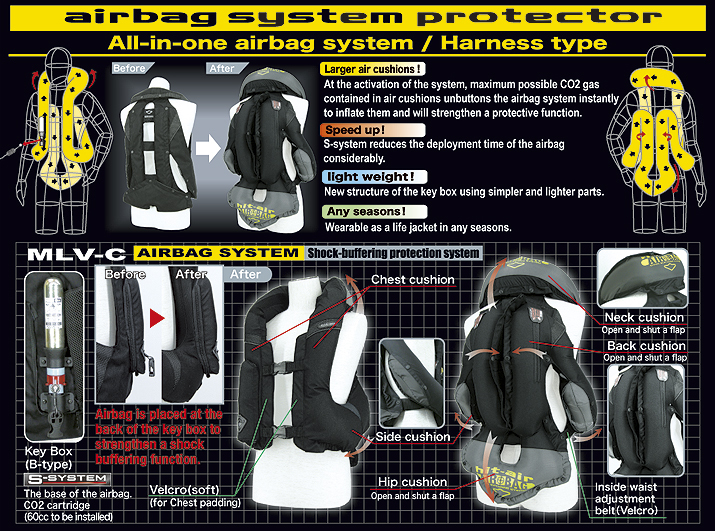 The three motorcycle air vests we offer in the UK have the latest Hit-air trigger mechanism and optimal air bag coverage. They are the product of over sixteen years of research, development and testing. See below to find out more. Find the Hit-air vest that is right for you below. If you require any further information or to place an order please call us at any time on 0845 894 2868. This is the best selling Hit-air vest for motorcycling worldwide. It is £425 including the canister and lanyard. This option is only available in black. This is the same structure as the MLV C but is made from florescent fabric and reflective strips for improved visibility during the day and night. It is £450 including the canister and lanyard. This option is only available in Florescent Yellow. This is the top of the range Hit-air vest. Again it has the same structure as the other MLV models but the vest is made from cutting edge reflective material. It is £490 including the canister and lanyard. Our motorcycle website is under development so we ask that you call us on 0845 894 2868 for more information and to order. All vests are under warranty for three years.